Here is some information on the most exciting portion of buying a new roof: choosing the color. Color can impact home value and energy efficiency. As you begin your roof investigation, you will quickly discover that not only are there many types of roofing available today, but each type comes in many colors. However, what can be more exciting than envisioning the appearance of your home’s roof and what it will do for not only the curb appeal but also the value and energy efficiency of your home? For example, if you choose a color that doesn’t go well with your home, you might dramatically limit the interest that your home will generate should you put it on the market for sale in the future. A long term metal roof can be a particular concern in this area because it is a lifetime investment rather than something that will be changed every few years, giving future owners of the home the opportunity to change the look of things. As you plan for your new roof, keep in mind just how much of your home’s visible exterior is the roof. In some cases, more than half of what someone sees as they drive up to your home is the roof. 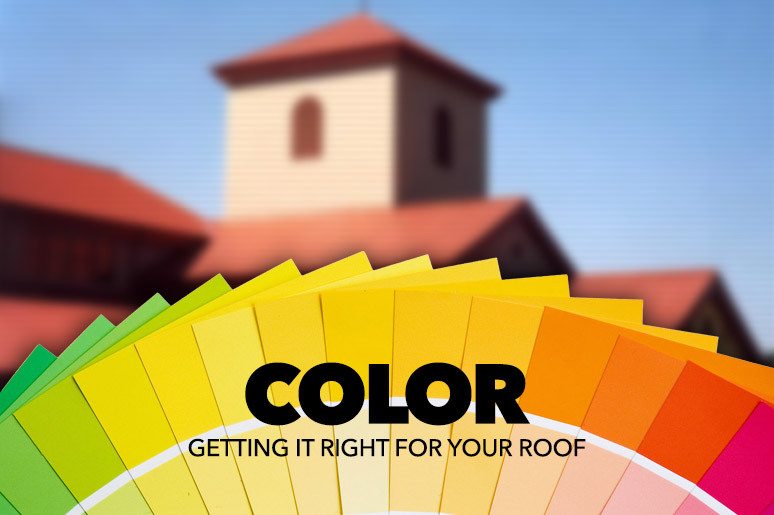 This realization may help you in understanding just how critical roof color selection is. And, with today’s wide variety of roofing materials, you are by no means limited to black, brown, or gray as your color selection. This widening palette of roof colors allows the roof to have much greater impact on your home’s overall look and feel. There are many great online resources for looking at colors and designs for home exteriors. Most of the paint companies like Behr, Sherwin Williams, and Valspar have online resources. Of course, consumer websites like HGTV and Pinterest can also serve as great inspiration. We suggest using resources such as these to help reimagine your home’s exterior. Changing the color of your roof just may lead to other changes as well regarding the colors on your home’s exterior. 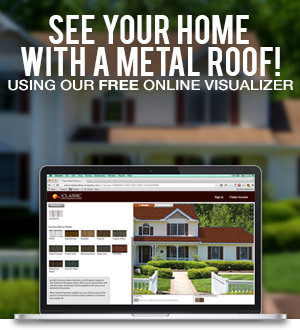 At Classic Metal Roofing Systems, we have long offered a wide range of colors to help homeowners find the perfect roof. What’s more, our PVDF coatings are unmatched for durability including long-term resistance to fading and chalking. One change we are seeing is a trend toward more “print coat” colors; colors that are not monochromatic. We offer our Slate Rock color series in Oxford Shingle as well as our optional blended ThermoBond powder coat finishes for textured and multi-hued color options. We can even create custom colors for you. How Does Roof Color Impact Energy Efficiency? Color can also impact the energy performance of your roof, making color an even more critical part of your roofing decision. While reflective pigment technology has been a game-changer in the roofing industry by allowing even dark colors to meet Energy Star standards for solar reflectivity, light colors including whites, grays, and tans will still out-perform reflective dark colors at keeping heat out of attic spaces. However, studies show that a thermal break can be more efficient at reducing air conditioning costs than a reflective color. A thermal break occurs when a metal roof has a separation between the metal and the roof deck. This small air gap blocks conductive heat transfer so that, even though the roof gets warm in the sun, it does not conduct that heat through to the structure. Note this 2001 study which shows an attic beneath a brown metal shingle with a reflectivity of about 17% being cooler than an attic beneath a white standing seam roof which had about 65% reflectivity. The reason is that the formed metal shingle has an integral thermal break between the metal and the roof deck whereas the standing seam sits right on the roof deck. Again, the thermal break performs much like a thermal window by stopping conductive heat transfer. As far as color and reflectivity, white has a reflectivity of around 65%. When you get into lighter off-whites, grays, and taupes, reflectivity is around 45% if the product is made with reflective pigments. Dark browns and grays and even black with reflective pigment will be 25 – 30% reflective, meeting the Energy Star requirement for reflective metal roofing. In contrast, dark colors without reflective pigment will be around 3 – 7% reflective. A reflective pigment is standard in today’s top-of-the-line PVDF coatings used by Classic Metal Roofing Systems. A highly reflective roof can reduce summer electric costs by 20% or more. This number can be increased with thermal breaks and good attic ventilation. Because a metal roof is a long term commitment, don’t settle for a less than optimal color choice just because it’s reflective. An additional concern is that a color like white will get dirty over time and lose its reflectivity. Instead, do all you can to specify a metal roof with a thermal break, and then boost your attic ventilation to meet code and enjoy the energy savings. If you also choose a system with a reflective finish, that will just be icing on the cake. From bold colors to make your house stand out on the block to earth-tones that can fit into most any environment or color scheme, a Classic Metal Roof offers many color options to fit your home just right, giving it a look and feel that you desire. To help with your color selection, please use our free online Visualizer tool to look at different colors of roofing on various homes or even to upload a photo of your own home. We even have tutorial videos to guide you through the process. If you have problems using the Visualizer, just email us a clear, straight-on photo of your home’s exterior, let us know what colors and products you’d like to see, and we will email back some images for your consideration. You can email the photos and information to us at info@classicroof.com. We hope that you have a great rest of the summer. Please call us at 1-800-543-8938 if we can ever be of help with your roofing, ventilation, or color questions.